Hi everyone it’s Cindy here. Today I’m joining the Hookin on Hump Day blog hop to tell you about my most recent Feel Better Friends (FBF) doll that I made. 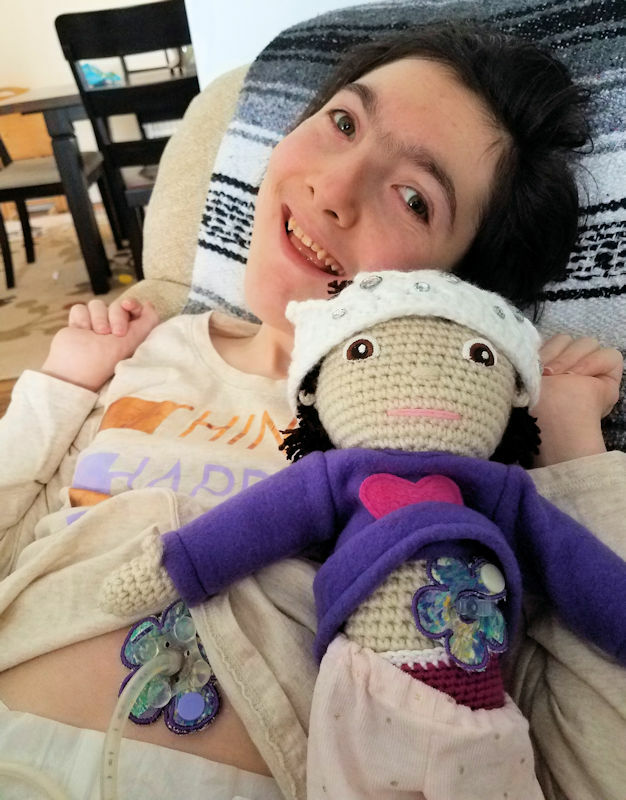 One of the things a FBF crafter does is to try and make the doll as much like the child as possible so the Mini Rylee has a feeding tube port (also known as a G-tube). G-tube ports look a lot like the valve of an inflatable toy so that is what I used. I found a package of 12 inflatable emoji beach balls on Amazon for a reasonable price and started from there (I receive no compensation for the Amazon link and include it for others to use). I included two outfits for the doll. 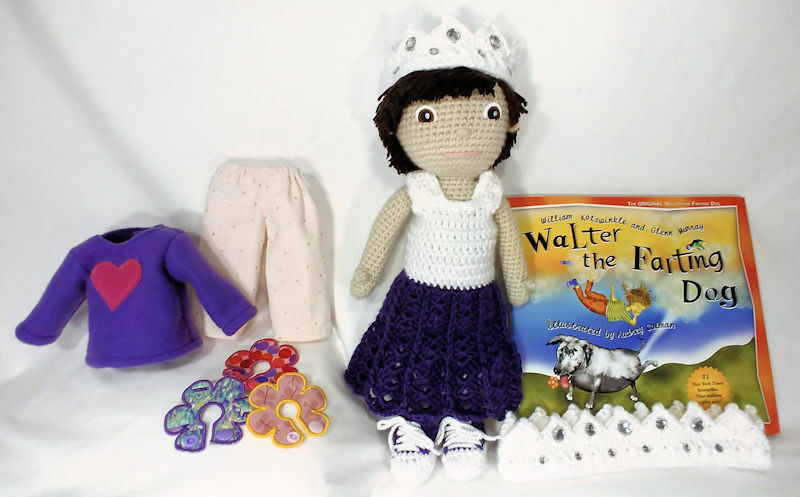 The crocheted dress you see above was adapted from a pattern for a barbie doll. I also made an outfit of pants and a t-shirt and to finish off the outfits a pair of purple and white sneakers. The hair for this doll was made using Knit Picks Shine sport weight yarn that was first hooked into the scalp. I then styled it as close to Rylee’s hair as possible. Since Rylee loves crowns I made matching ones for her and the doll. I found a pattern that included sizes from adult to newborn. I made the adult size for Rylee and the infant size fit the doll perfectly. I used Caron Simply Soft in white with Red Heart Shimmer in Snow held together to make both crowns. The Shimmer yarn gave the crowns a bit of sparkle. Then I added a few “jewels” to spruce them up a bit more. According to her mom, “Rylee loves her doll! The crown and book were hits too. She squealed with delight, she was so excited!” The book she is referring to is Walter the Farting Dog. When I saw that she enjoyed fart jokes I knew I had to get her that book. My Walter included a note with the book for her too. Another one of the extras I included were some G-tube pads for Rylee with a matching one for the doll. 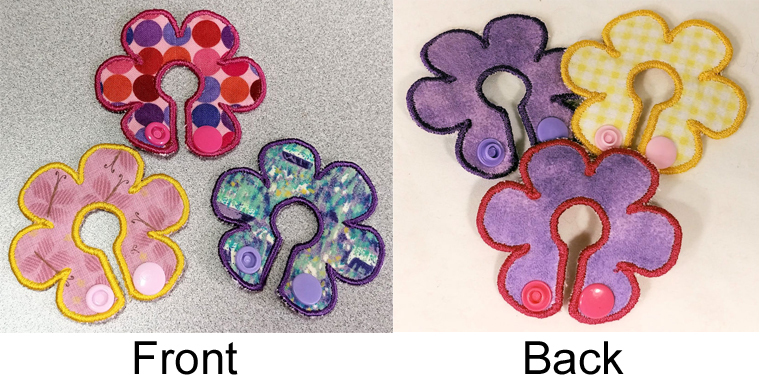 I found some pads similar to the ones above on Etsy and knew I could make some just like them with my embroidery machine. They are made from 3 layers of absorbent cotton with flannel on the back for softness. Rylee’s mom said, “Rylee named her ‘mini me’ Joy. Our moto is Choose Joy and we say that a lot to remind ourselves that God is good and we can choose our attitude. Thank you for bringing us a little Joy!” So far each of the dolls that I’ve made have had something new to work into them. I enjoy the challenges these dolls give me and I think Rylee’s smile is all the thank you I need. 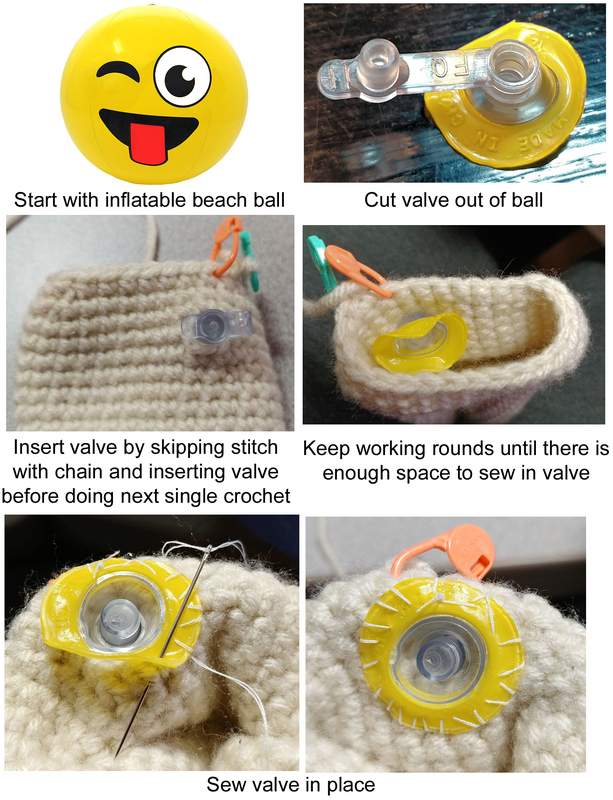 Making Feel Better Friends dolls has been a great way to use my crochet skills for charity work. 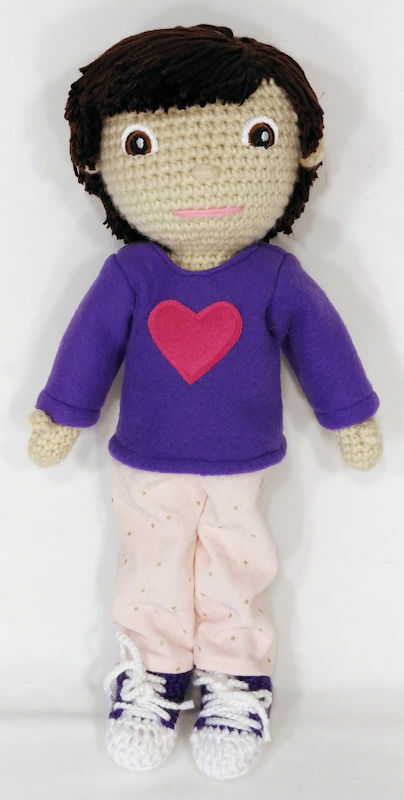 If you know of a child with medical problems that you think would benefit from having a Mini Me to help them you can visit the Feel Better Friends website to request a doll. 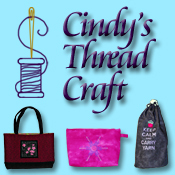 I am assigned to the northeast USA but I think you can request a specific crafter if you would like. Love this charity & love the doll! What a pawsome thing to do! And the doll is so cute! It was such a joy to see how happy Rylee was with her mini me. We are constantly amazed how much they look like the person they are being created for. This is so sweet! Your dolls are amazing. 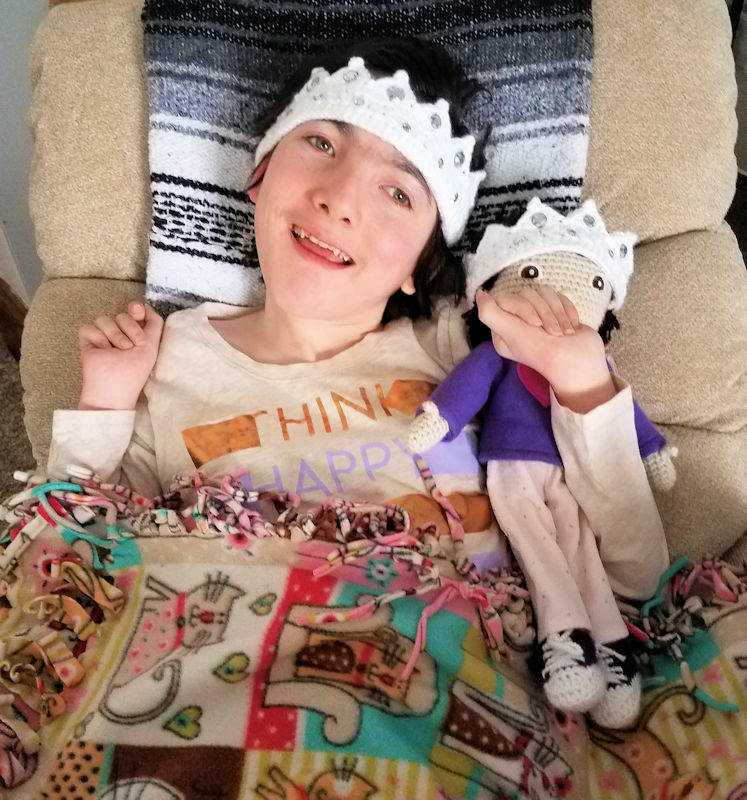 Making Feel Better Friends dolls feels amazing; and it’s so wonderful that you heard back from Rylee and her family! Your posts are always SO inspiring and they do make me cry in the best way. What an amazingly creative spirit and good heart you have to go so far to make each doll so perfect. What a great idea! You got every detail! Your post brought tears to Mom’s eyes. Tears of sadness that Rylee has to suffer so much, but also tears of joy for what you have done to bring those beautiful smiles to her face. Thank you for that!!! OH that was an awesome idea. i LOVE IT. Love making things that will help and encourage others. Good job!!! That beach ball tube is just brilliant and so thoughtful. You get a gold star for putting that sweet smile on Rylee. ⭐️ Blessings to you! Oh how wonderful. I just love how you make each one so special for each child. Cindy this is truly an amazing use of your gifts and a wonderful expression of your compassion. What a beautiful way to share them with these children and their families. That is a great program! I love your creativity to create her custom doll!